Wanna eat Nutraloaf prepared by Red herself? Yeah, probably not. But eating in an Orange Is the New Black-themed restaurant does seem like the perfect way to celebrate binge-watching all three seasons this week as prep for season four. Now you can do just that. 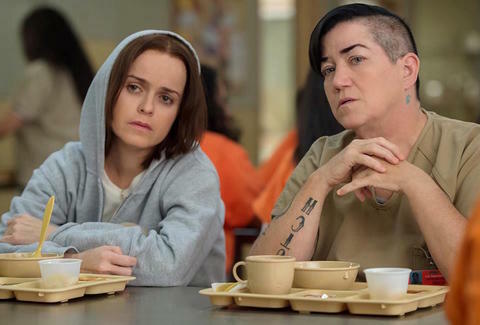 For two days only, an Orange Is the New Black pop-up diner will be dishing out prison-inspired delicacies, turning Singapore's OverEasy on Orchard Road into Litchfield Penitentiary Cafeteria. Chef Bjorn Shen told Mashable that he'll for sure be serving up Nutraloaf, but instead of three meals blended into paste and turned into a loaf (ew), his version will be far more appetizing, with "mushrooms, cheddar, quinoa, pumpkin, and nori." Is that really the same thing then? To ensure you feel like you're truly in prison, the food will be brought on a plastic tray, and it's rumored that forks and knives might not be available. Because, you know, it has to be authentic. This will all be going down June 16 - 17, and yes, in Singapore. But if you happen to be in Singapore, you should absolutely book a table on Chope and peruse the full menu. Mashable notes that only "limited walk-ins will be accommodated." And if you're not in Singapore, you can just combine everything in your fridge, turn on Netflix, and use your imagination. Kara King is a News Writer at Thrillist and will be combining everything in her fridge later. Send news tips to news@thrillist.com and follow her at @karatillie.